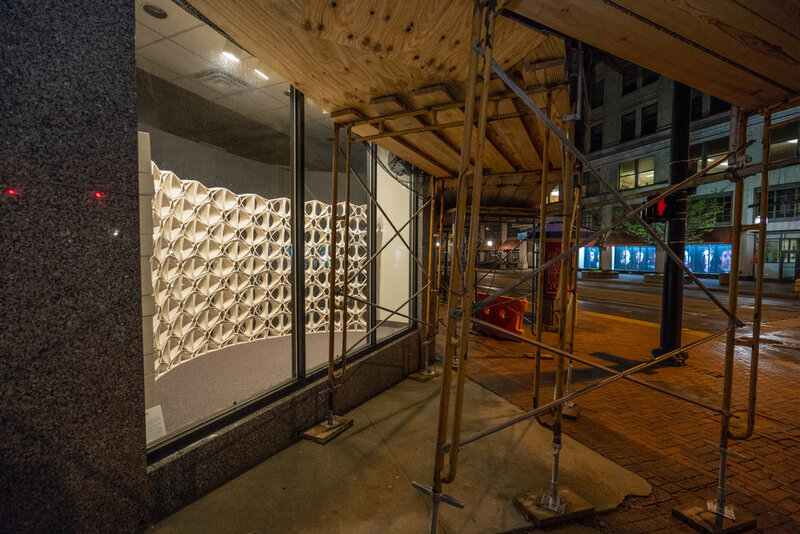 The Curated Storefront will showcase the work of exemplary regional artists along with other art and cultural objects while lending dynamic visual excitement to the streetscape and attracting the public to Akron’s underutilized urban center. Regional artists and established curators from area art museums and institutions will be invited to organize rotating shows involving the visual and performing arts as well as design, experimental video, and new media projects. Stay tuned for a list of featured artists and scroll to the bottom of the page to see past participating artists. Drew Ippoliti & Charley O'Geen with assistance from Drew Ippoliti & Charlie O’Geen With assistance from: Julie George, Morgan Jones, Catie Newell, and Kayla Weinman. Exhibit located at the O’Neil Building, 222 South Main Street/King James Way. 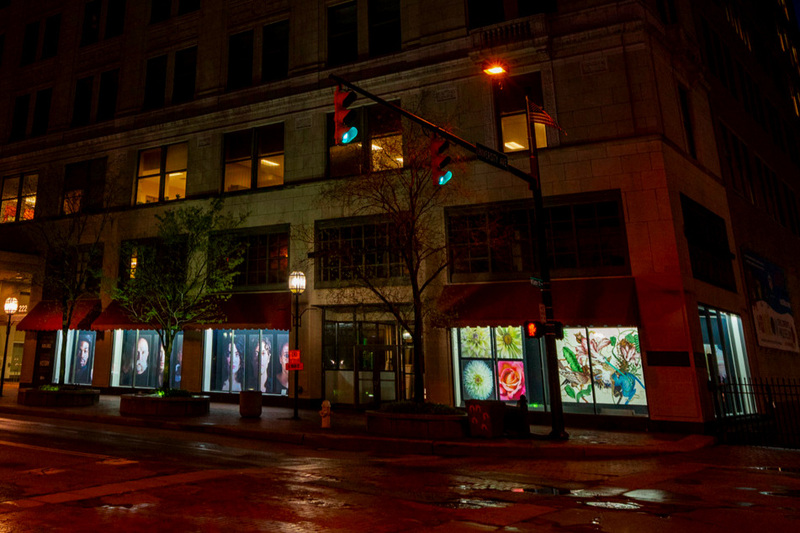 In the spirit of hope, rejuvenation, and the celebration of lovely beings, artist Jeffrey Fulvimari designed and illustrated 'Angels and Goddesses' specifically for the historic O’Neil Building storefront. 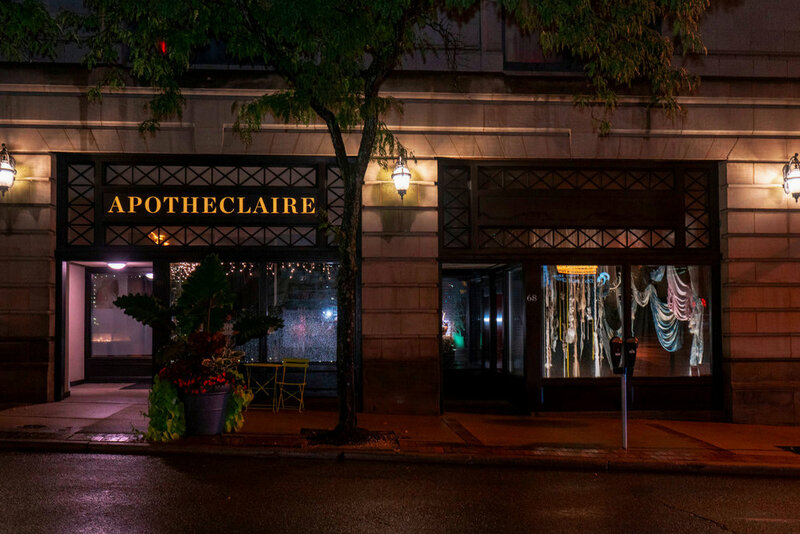 An Akron native who studied to become a professional artist, his professional career started in 1993 and began with commissions for Barneys New York and Interview Magazine. You can find his illustration work in a children's picture book, 'The English Roses', by American entertainer Madonna. Jeffrey Fulvimari was born in Akron, Ohio. He attended the Cleveland Institute of Art, and the Cooper Union in New York City, where he studied photography, video, and conceptual art, receiving a Bachelor of Fine Arts Degree in 1985. Jeffrey currently lives and works in Upstate New York in a picturesque cabin in the woods, by a lake. Jeffrey started his illustration career in 1993, which began with commissions for Barney’s New York and Interview magazine. He was a contributor for Interview for several years, and went on to work in all aspects of printed media, including advertising, sales promotion, and editorial layouts. His illustrations have been animated on Nickelodeon, MTV and VH-1, The Food Network, and in numerous television commercials in Japan. 1998 he was invited to exhibit his work at the Parco Gallery in Tokyo, which launched his Japanese career. In Japan he has published two monographs, IT’S OK AND EVERYTHING’S GONNA BE ALRIGHT, in 1998, and JEFFREY FULVIMARI’S GREATEST HITS, a collection of drawings, photos, songs and poems, in 2003. He has since exhibited extensively in solo shows of paintings and drawings throughout Japan and Asia. Click here to view Asbury Park Boardwark Video Interview with Jeffrey Fulvimari. Special thanks to Jeanne Tassiello Jordan at Lock 3 Akron, Ohio for coordinating efforts to help make this incredible connection happen. Thanks also are extended to Arnold Tunstall at the Emily Davis Gallery at the Myers School of Art for helping make the connection with student Emily Olszewski for canvas stretching assistance. 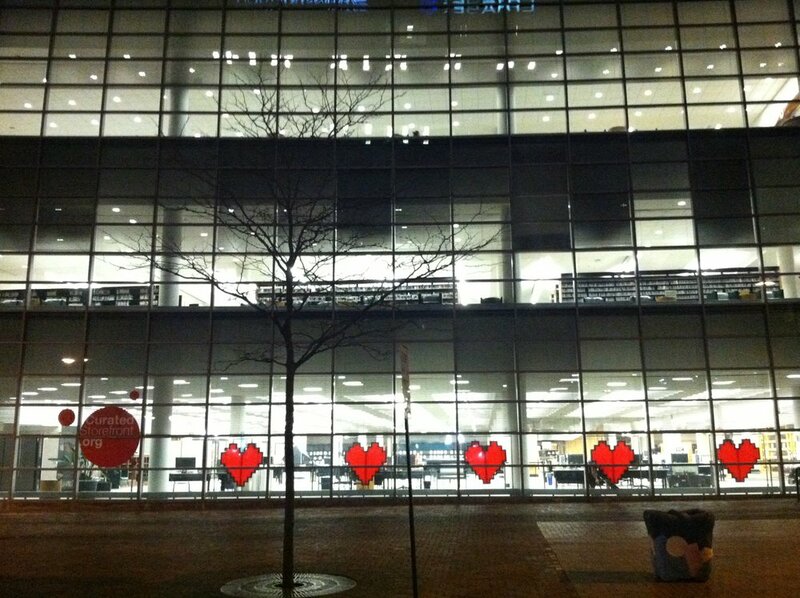 Exhibit is located at Polsky Building South, 225 South Main Street/King James Way. I paint large scale realistic portraits as a way of creating icons out of ordinary people and exploring gender identities. Max Markwald graduated from The University of Akron, Myers School of Art, with a B.F.A emphasis in Painting and Drawing in Fall 2016. His realistic portraits have explored iconic figures and gender identities. In the summer of 2017 he received the Academy Merit Scholarship to attend a month long residency at the New York Academy of Art. Markwald has had solo exhibitions at the Massillon Museum, 22 High Street Gallery, and Malone Art Gallery. Currently his studio is located at the Summit Artspace and he is preparing for an upcoming solo exhibition at the Transition Gallery, which will open in September 2019. Most artwork on exhibit is for sale by the artist. Inquire with the artist with your interest. Exhibit located: Cascade Plaza, 1 Cascade Plaza. 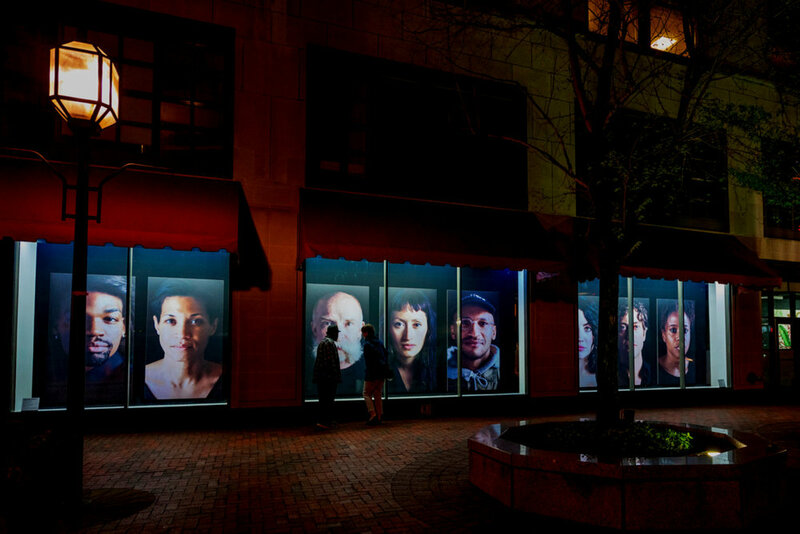 Displacement is an examination of space, material, and pattern along with consideration of regional history and sense of place native to Akron. The work illustrates how discarded materials can be revitalized and energized through transformative labor creating objects and social experiences. The work aims to encourage the audience to perceive the surroundings in a new frame while providing a method for alternative construction systems. Drew Ippoliti (@drewippoliti) is an artist, researcher and educator curious about the places where craft and culture collide. Drew resides in Northeast Ohio, while serving as a faculty member at The University of Akron’s, Myers School of Art. Charlie O’Geen lives and works in Detroit, Michigan where he operates on existing site conditions for use as building systems. The work acts as a model to expose opportunities of existing material energy and stands in opposition to materially consuming conventional building practices. O’Geen recently founded etC Construction Services that partners with designers and builders looking to re-connect material and construction to architecture. Exhibit is located at the Mayflower Manor, 263 South Main Street. I am interested in the perception itself, and the processes of sensing in relation to those of understanding. While focusing strongly on the visual presence of the work and the physicality of the mark, I am simultaneously interested in the impalpable. I like to think of drawing and painting processes as structuring the air, embracing its absurdity yet believing in its potential to reveal meaning. In the latest body of work, I used images of collected patterns found within Serbian ethnic embroideries. The process of manipulating and enlarging these domestic and small-scale elements into the landscape-like fields of abstracted conceal and transform the scale and nature of something mundane, familiar into unknown, new, even peculiar. The process of juxtaposing geometric with ethnic elements reflects my contemplation on time, layering of history and present. Painting in the same way keeps operating between memory and anticipation with its contradicting potentials to suggest movement and time despite its stillness and singularity. Born in 1977 in former Yugoslavia, Dragana Crnjak received her M.F.A. in Painting and Printmaking from Virginia Commonwealth University in Richmond, Virginia. She is an interdisciplinary artist whose work is primarily based in the medium of painting and processes of drawing. She is a recipient of Ohio Arts Council Individual Excellence Awards in visual art for 2008, 2011, 2015, Research Professorship from Youngstown State University, and Virginia Museum of Fine Arts Professional Fellowship in drawing. She had taught art at University of Virginia and The Cleveland Institute of Art. She is currently Associate Professor at Youngstown State University, Ohio, teaching painting and drawing. 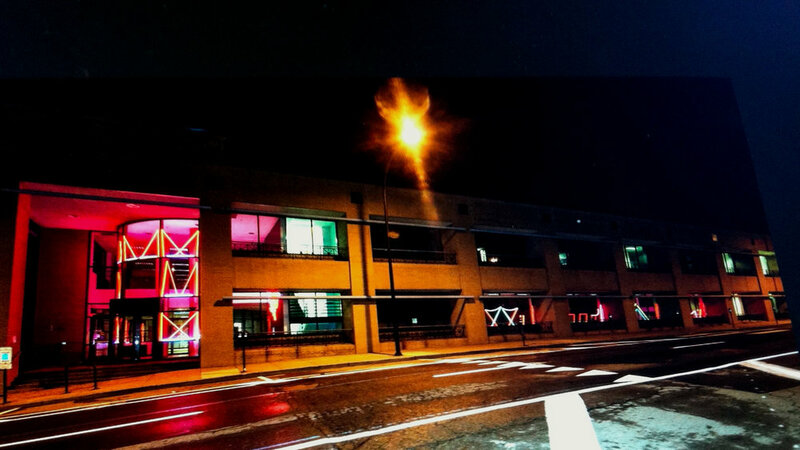 Reverie is located at the Law Building, 161 South Main Street/King James Way. In this series of work I was interested in the issue of individuality in the sociopolitical context of the western society. Specifically, in which ways technological advancement, consumerism and global politics influence the emergence of an individual. I find this constructed individual dormant and passive. In my work I speak about this latent state. The process, as well as the treatment of the material, emphasizes the content. I use porcelain. My aim is not to explore the properties of the medium but rather to use it as a metaphor. Its supposed fragility and preciousness works as a metaphor for our preconceptions of an individual, but I do not foreground the material itself. The surface is left dry, pale, unglazed. The composition is typically achieved by the use of large number of multiples, which to an extent reference serial production. I started with a generic object ~ a mannequin head. Forms that are identical in appearance became unique through various types of manipulation, be it tearing, slumping, dropping, or otherwise. Albreht has exhibited internationally since 1997, including Austria, Belgium, Croatia, Denmark, France, Germany, Ireland, Italy, Serbia, Slovenia, South Korea, Spain, Taiwan, as well as across the United States. He has participated in many international competitions such as: as well as artist residency programs in Europe, Asia and the United States. In 2007 he received Special Prize at the 4th World Ceramic Biennial in Korea (CEBIKO). 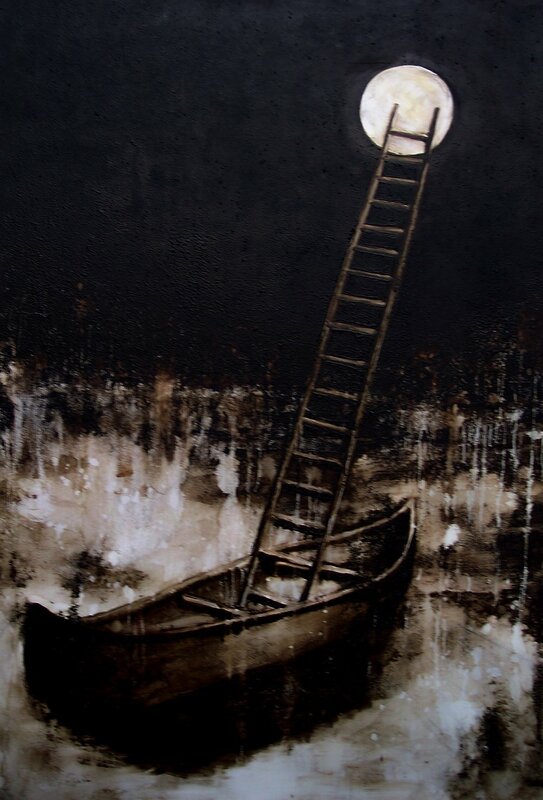 He was awarded Florida Individual Artist Fellowship for the Visual Arts in 2012. His work is included in public and private collections globally. He is elected member of the International Academy of Ceramics (IAC/AIC) since 2009. Artwork is for sale by the artist. Each individual object from the series is set at $1,400. A group rate will be applied if there is an interest to purchase several objects at a time. 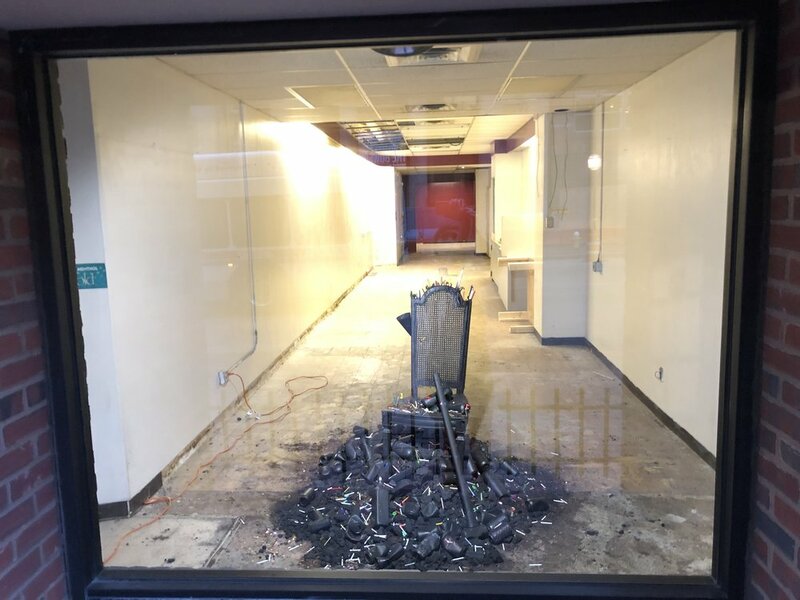 Exhibit soon to be located at 175 South Main Street/King James Way. 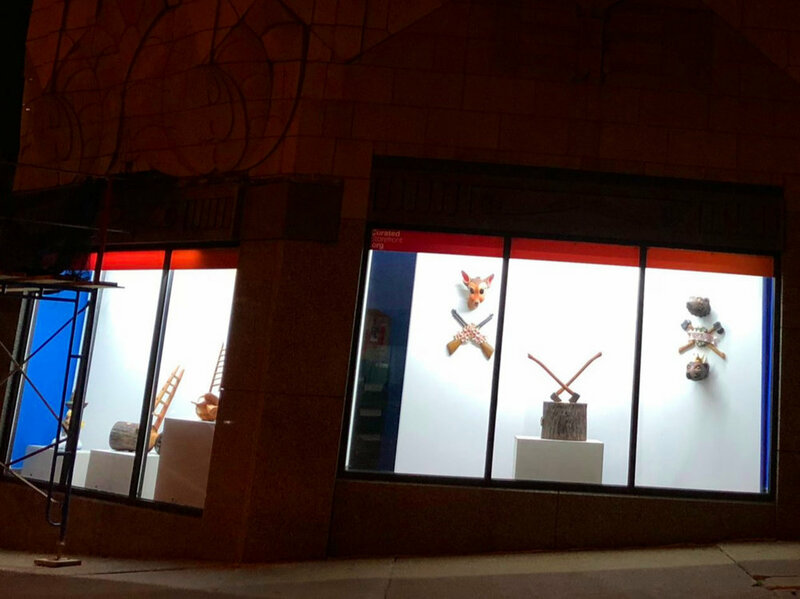 Exhibit located at both corners of the Polsky Building, 225 South Main Street/King James Way. and movements which are the patches of color changing position." 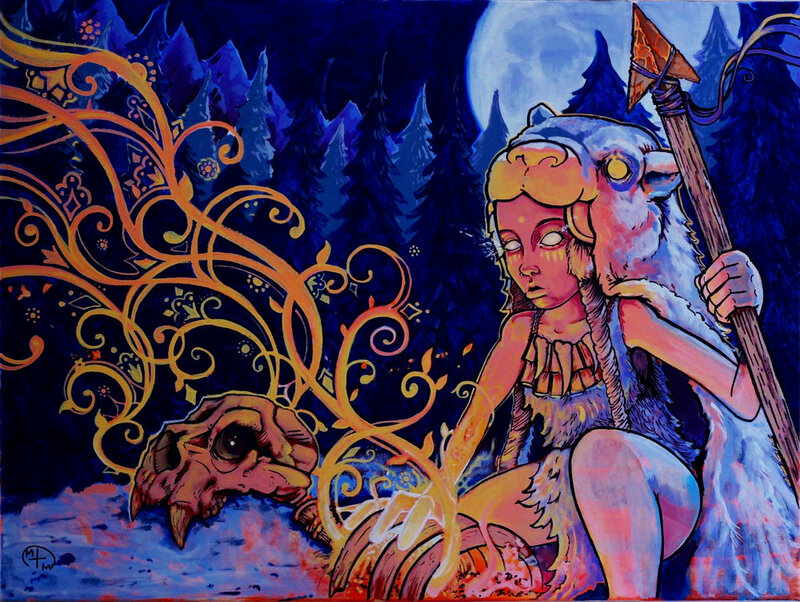 Steve and Casey both graduated from The University of Akron's Myers School of Art with a BFA in painting. Exhibit located at 106 North Main Street, Northside District. I’m interested in the transformational power of humble materials. Heavy concrete lifted by light, lightweight basswood brought down by the gravity of shadow. Elemental shapes and texture making a simple space mysterious and intriguing. Kit Freund received his MLIS from Kent State University, and is currently a social worker in Akron. As a musician and sound artist hiswork has been released, performed, and installed worldwide. An interest in modern art and architecture has led to creating concrete sculptural pieces. This artwork is for sale by the artist. Exhibit located at the Birth & Death Records Building, 365 South Main Street. As someone who designs and fabricates lighting and furnishings, Dominic Falcione, created a mural with 10 colors of masking tape on plastic film that was backlit to produce a bright and colorful nighttime display. 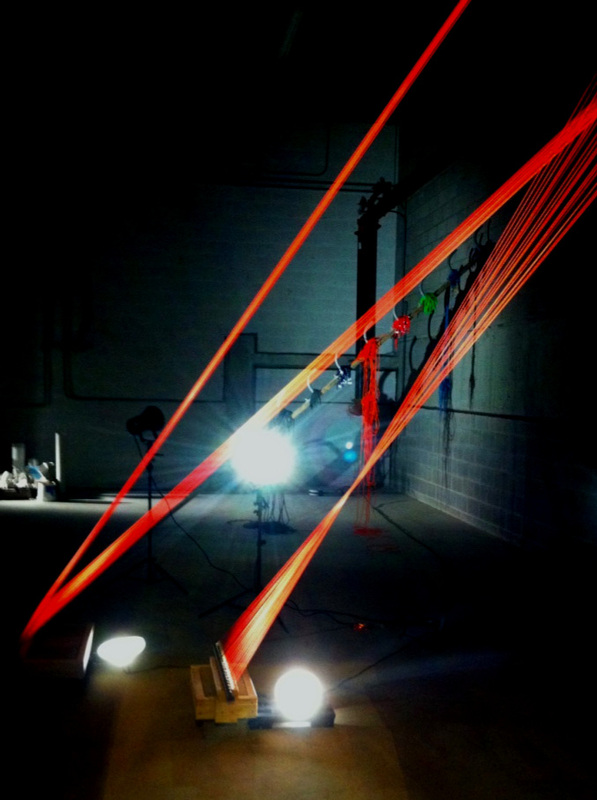 This installation was created one colored line of tape at a time. This mural was intended to enliven the whole building with walking and driving traffic in mind. It was an exploration in using the graphic quality of simple materials to create a dynamic and colorful artwork. During the installation process, Dominic became more painterly with the materials and discovered that by layering the tape he was able to create complex forms with color contrasts, highlights, and shadows. Changing the background color of the light also transforms the overall colors and effect of the design. 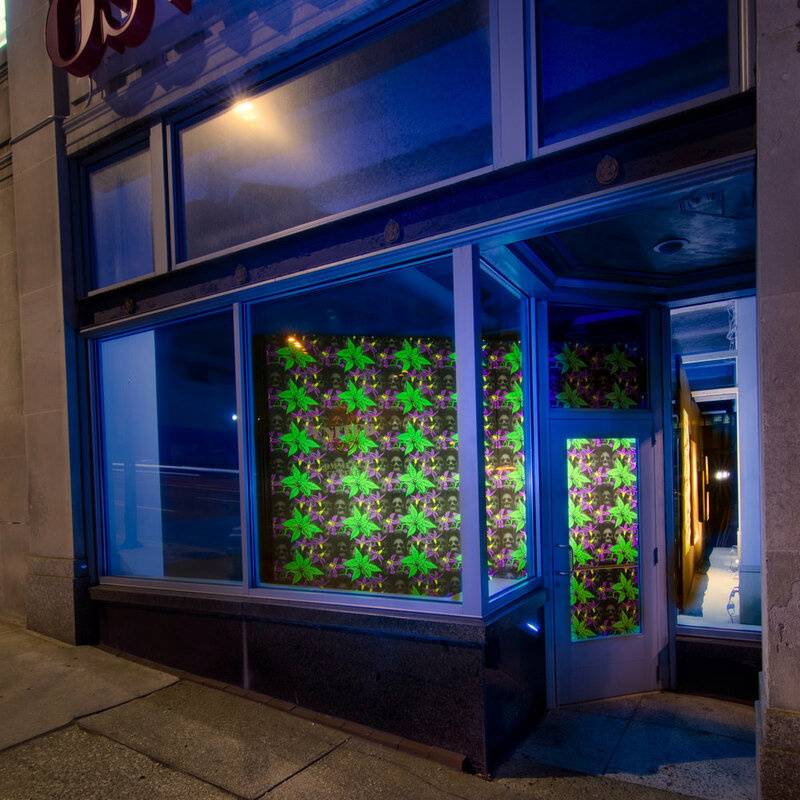 Dominic hopes that the idea of creating a bright colorful graphic look of eye-catching displays, using common and simple materials, can be utilized in other ways to activate storefronts for special occasions. This process, although time-intensive, allows for a variety of visual graphic expression. Exhibit located at the Law Building, 163 South Main Street/King James Way. My most recent works include autobiographical prints, sculptures and installations that address vulnerability, relationships, and celebration. Through examining my role in a family dynamic fractured by alcoholism, and with the new found sobriety of a loved one influencing me greatly, I’m able to document and work through past, current and future struggles in my practice. Through shifting the focus from others’ battle with this disease and how their fight has affected me, I’ve started to look at the feelings, challenges, and consequences that center around my own drinking. Much like my other work, this installation is inspired by the same ideas and the imagery was created through analyzing memories and recent occurrences as well as dissecting music that I feel describes a certain feeling, place or time for me. Winnie Daulbaugh received her BFA in Printmaking with a minor in Art History at the University of Akron Myers School of Art in the Spring of 2018. 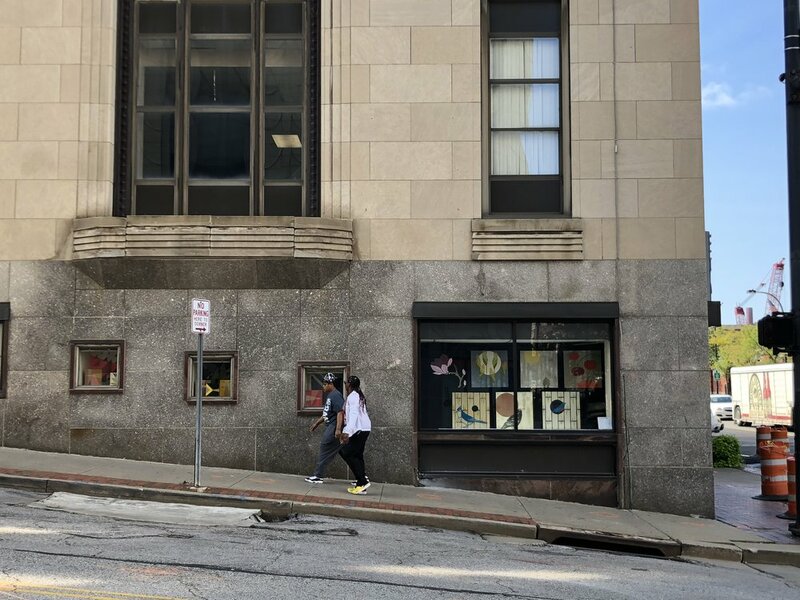 As former President of Akron Print Enthusiasts, Student Art League Representative on the Myers Residency Committee and Shop Assistant in Printmaking, Winnie led initiatives that enabled travel and enrichment opportunities for students and the community. She has received the Gillette Study of the Arts Abroad Scholarship, Myers Gold Art Studio Scholarship, and the Folk Charitable Foundation Venice Biennale International Travel and Study of Art Scholarship. Winnie has also received both the Dashiell Travel and the Dashiell Tools and Materials Grants. She currently works at the Akron Art Museum, shows her work both locally and nationally, and is looking to pursue a graduate degree in fine art in the near future. Exhibit located at the Law Building, 165 South Main Street/King James Way. Darlene VerSluys is a photographer, fine art framer, and curator. She has owned and operated Akrona Galleries in Akron, Ohio since 1990, where she actively helps artists sell their work. She studied social work at Eastern Michigan University and has exhibited her photography in regional art shows. Akrona Galleries has been providing exceptional art related service and insight; it is heavily involved in the genesis, appraisal, and curation of both personal and corporate art collections; and designing and framing artworks for entire commercial spaces. 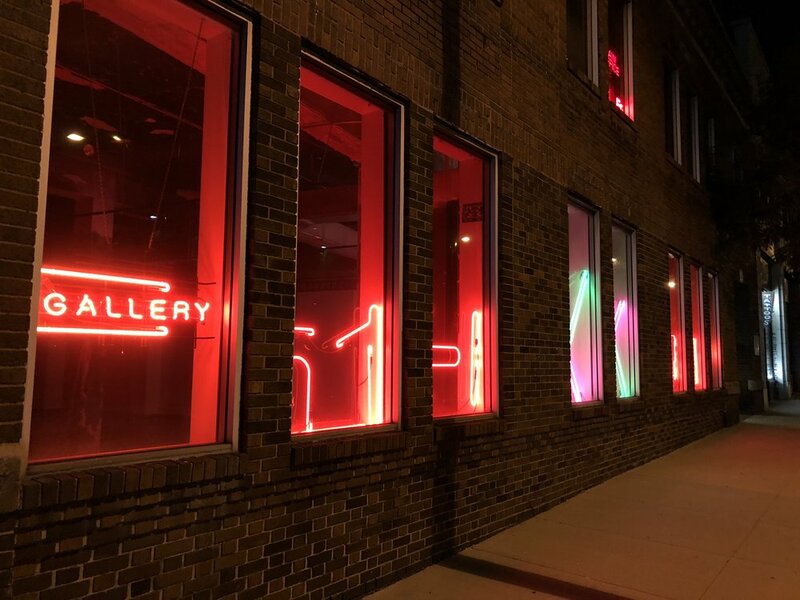 Visit the gallery in Wallhaven on Market Street or go online to learn about upcoming events and venue rental options, as well as discover everything this gallery has to offer to you and the community. AKRONA Galleries: one of Ohio's most unique full service art galleries. Serving the Greater Akron Area and abroad; offering sculpture, original paintings, blown glass, jewelry & fine art reproductions. With an extensive body of artworks by varying selections of artists—a mixture internationally recognized as well as locally established— we involve ourselves in bringing a knowledge and understanding of art to the community. Exhibit at Polsky Building North Corner, 222 South Main Street. This piece was created for the Juxtapoz Clubhouse Miami Art Basel 2017. During the month of December I have played mainly with the colors of the flag of my hometown, Quarteira in Portugal (Blue and White), this small city in the south of Portugal where I was raised and that I carry with me the whole time super proud! Exhibit located at 68 East Mill Street, Greystone. My work is a response to my surroundings, my neighborhood and things I encounter to, in the words of artist George Georgiou, “remind myself of the significance of the ordinary and familiar that is right in front of my nose.” My digital camera allows me to give compositional order to visually chaotic locations, while also documenting change in my surroundings over time. Laser engraving, screen printing and collage bring a physical property to my photographs and keep my hands engaged in the making of the work. 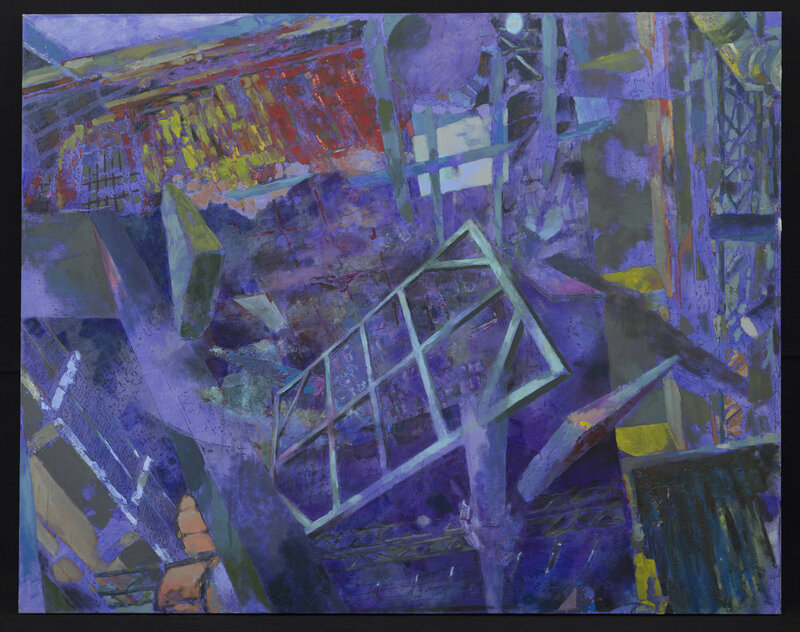 Organizing a living collage of overgrown, layered and peeling urban grit through photo-based media, my work engages time, deterioration and human-wear with photography, screen printing, reductive engraving and collage. I process my digital photographs with a laser engraver to manipulate the paper's painted surface. By painting layers of ink on rag paper or glass, the laser is controlled to reductively etch the photographic image through the inks layers. The resultant image is textured and distressed though still recognizable and relatable to the original photograph. I’m drawn to formal elements; textures and patterns that are developed through natural and human-influenced deterioration. These weathered surfaces are enhanced and overwhelmed by the noisy surface of the laser-etched inked paper and glass. Recently, I have begun to collage laser-engraved and screen printed elements together in order to create compositions of greater scale and complexity. I am referencing the peeling surfaces of old billboards, walls covered in layers of wheat-paste advertisements, and faces weathered by time and environmental factors. As I continue to grow with this process, I plan to experiment with the impact of weather, sandblasting, laser engraving and other reductive processes on my collages to create tension between image and object, digital and analog, control and chance, representation and abstraction. Micah Kraus is an artist and educator living in Akron, Ohio with his wife, artist Kim Eggleston-Kraus and two dogs, Jonny Freckles and Rosie Squeaks. Artwork is for sale by the artist. Inquire with the artist for pricing and availability. Diane Davis-Sikora with the assistance of co-collaborators Bo_Sheng Liu, Chip Clark, electronic artist Chris Yewell, and over *50 CAED Design Students in final production.